Create time claims by recording your time using the ExpenseIn time module. 2. 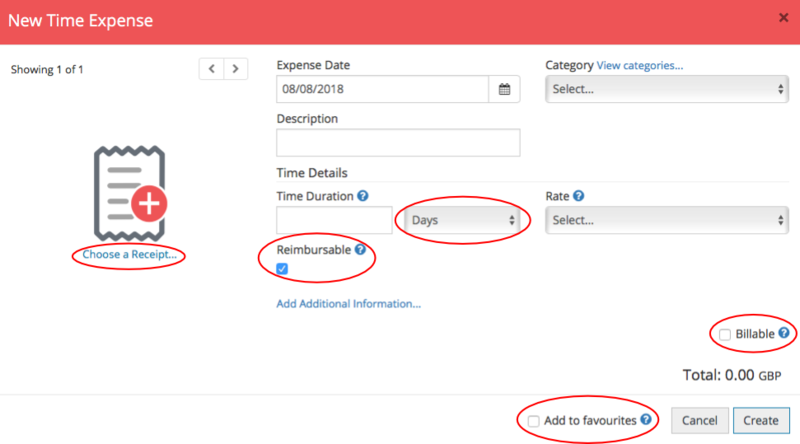 Choose the expense date, enter a description for the time claim and select the appropriate category. 3. Enter the time worked and select whether this is in days or hours. 4. If your Account Administrator has set a fixed rate for you then you can select this from the Rate dropdown. Alternatively, if fixed rates have not been set for you then you can input the rate yourself. 5. The time claim will either be reimbursable or billable. Tick the appropriate box to reflect this. 6. If you have any receipts that you need to attach to the claim, click the receipt icon. 7. If you need to add extra information to the claim then you can click Add Additional Information. 8. If you submit this time claim on a regular basis then you may wish to add this claim to your favourites. Click Create to add your time claim to your account. The time claim will be sent to your Draft expense section.